At first I thought it is because I am having VS 2008 installed as well … (which is required for me to work on some legacy ASP.NET applications). With little frustration I tried to Google this error and with surprise I was not the first person to get confused with this message. 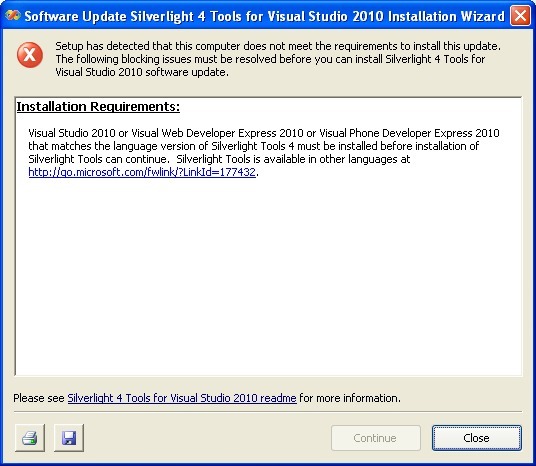 Apparently, when you install SP1, Silverlight tools also gets installed with it .. voila !!! This is really silly to see this error without actual reason. At least, it should let me know that I already have this thing installed so it cant install it !! 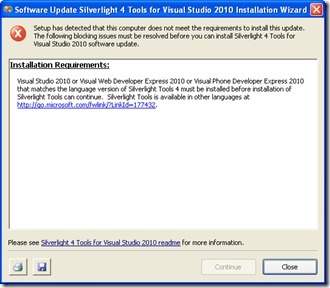 This entry was posted by Gaurang on May 9, 2011 at 8:53 pm, and is filed under Tips, Visual Studio. Follow any responses to this post through RSS 2.0. You can leave a response or trackback from your own site.